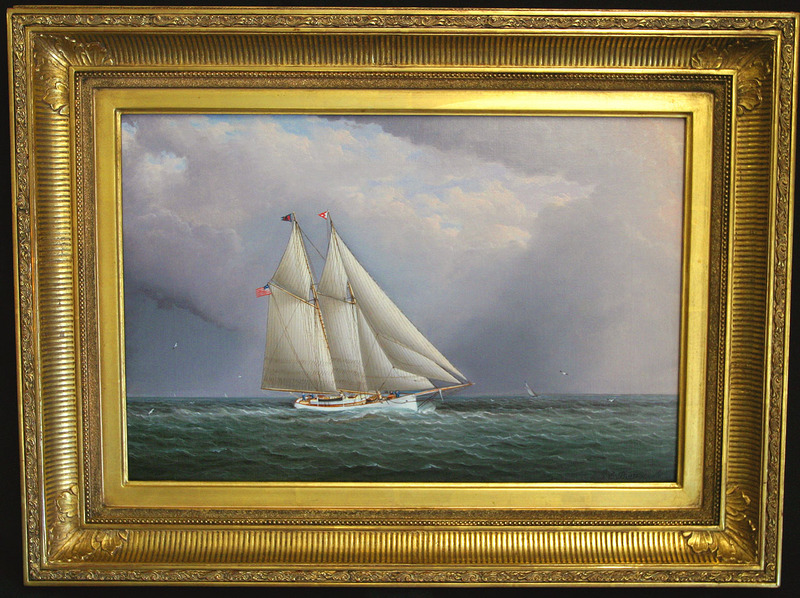 A quality work of art, capturing a leisurely day sail by one of the 19th Centurys elite American schooner yachts, AGNES of the Atlantic Yacht Club, under the command of her owner, Commodore Latham Avery Fish. 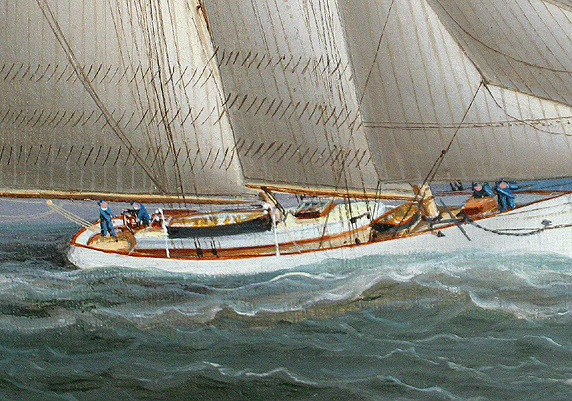 AGNES was one of the best known Class B racing schooners throughout the eastern seaports, a common presence for years at regattas in the 1870s and 1880s, often accompanied by her club mates, the schooner yachts PEERLESS and TRITON. Built in 1871 by Cornelius & Richard Poillon in their Greenpoint, Brooklyn hometown yard, she was designed by William Townsend, most famous as the designer of the grand Schooner SAPPHO. The smaller AGNES measured 53'11" at the waterline, 16'9" Beam and 6' draft. 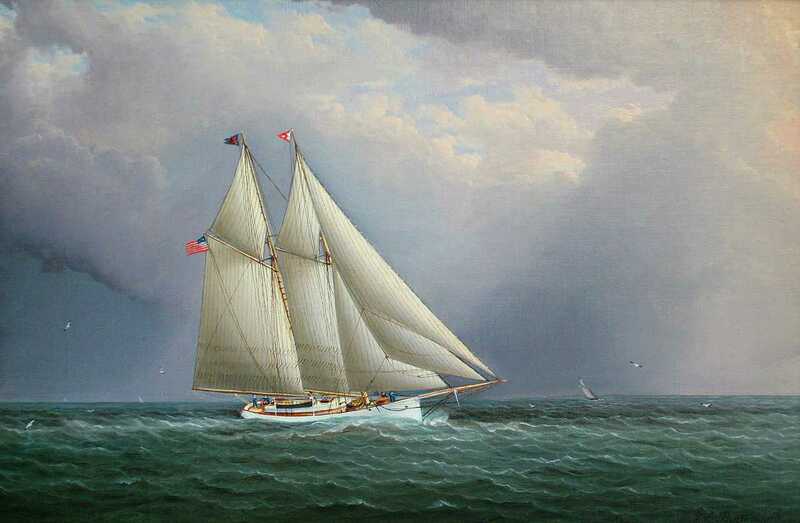 She had a solid performance record as the flagship of the Atlantic Yacht Club, and afterward sold to J. Norton Winslow when Commodore Fish upgraded to the massive schooner GREYLING in 1883. Buttersworth frequently accepted direct commissions from yachtsmen, as is likely the case here. 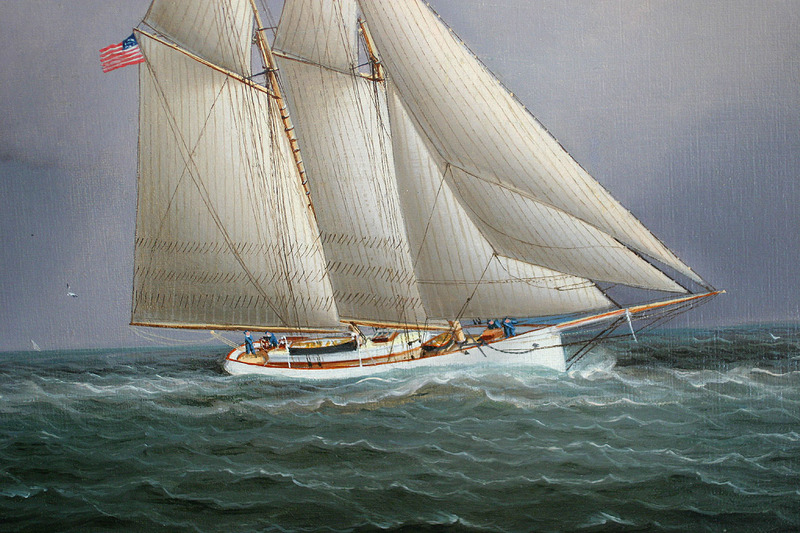 The sharp details and gracefully drawn lines of the racing schooner AGNES are well represented, as is her yacht club pennant, personal A signal and crisp American ensign on display in the soft breeze. Just enough sunlight is shown breaking through the heavy coastal atmosphere, stylizing the sky as Buttersworths own. AGNES lasted more than 25 years before selling to foreign owners. Provenance; Private Paris, France Collection.